When I first started wearing nail polish I really never thought RED would be one of them. It's very blam! in your face, "look at me, I got red nails!" And yet, the more polishes I tried or experimented with the more I kinda fell in love with a good red nail. I had wanted a berry red for a long time and started stalking Essie Size Matters on the nailpolishcanada.com Hot Deals section. It was discounted and I just loved the shade of red and really should have bought it when it was cheaper, but it was summer and I was swayed by summery bright shades and Size Matters felt like more of a fall/winter red. Except I waited too long. Come fall it was no longer on sale. Boo :( No red for me. Close to Christmas this year, Essie released duo packs with a classic Essie color paired with a Luxeffect Top Coat. I'm a preschool teacher and one of my sweet student's gave me this fantastic polish duo pack as a Christmas gift (since her mom knew I was such an Essie fan ;). I now had an Essie red of my own! 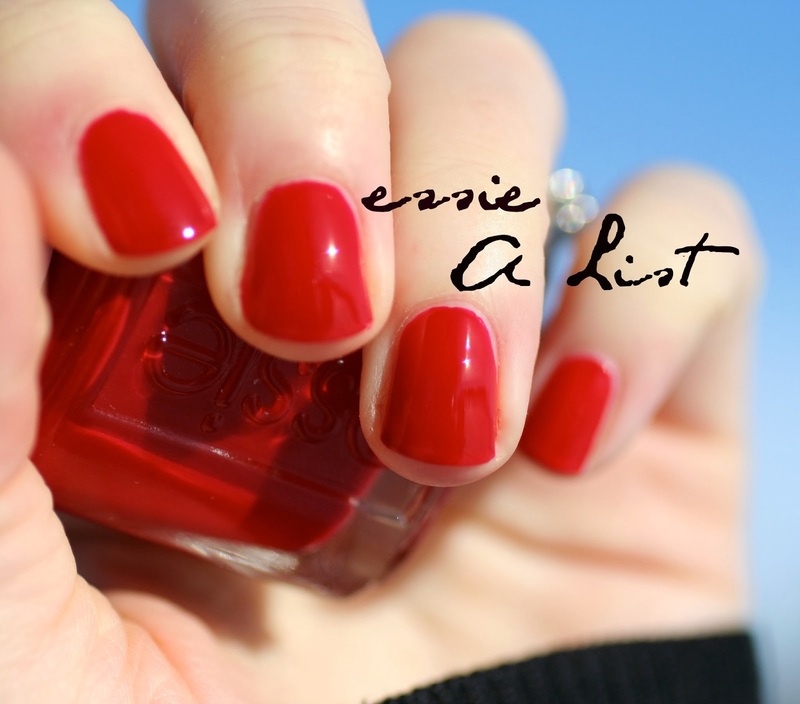 Essie A List is a lovely rich red that originally came out way back in 2002, making it kind of a classic shade. It somehow has both blue AND orange undertones (figure that one out) and that's probably why its such a flattering red that I would venture to say it would work on most skin tones. Even my friend Bailey who told me "I just can't pull off red...they always look weird on me" tried this one and liked it. Applying this color was a breeze. 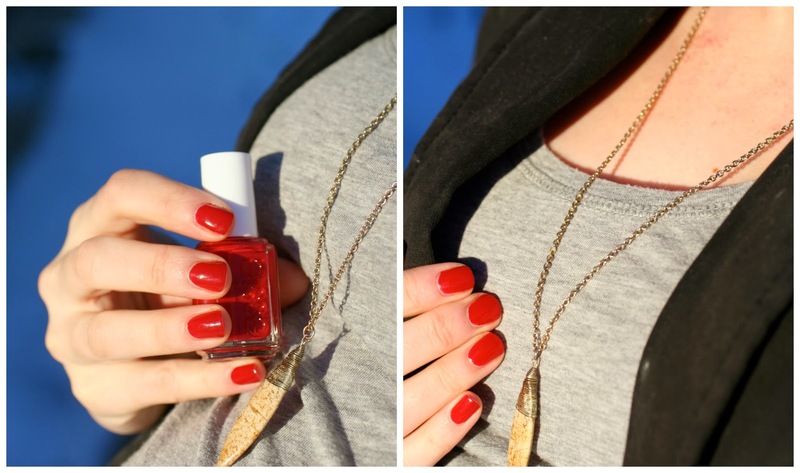 Two easy coats, fantastic formula. This polish has a bit of a "jelly" finish which means it's not totally opaque the way a cream would be, but has more of see-through glossy squishy finish. A List was paired with a newly released Luxeffect polish called Sparkle on Top. It's a clear base that has shards of iridescent glitter in it. I wanted to show you how the two polishes paired so I added some Sparkle on Top just to the base of my nail. And there's a shot of my 9 month baby bump...due any day now! I'm so glad Essie brought this color to the forefront with this year's Christmas duo pack or else it never would have been on my radar. You can still find a few of these packs in clearance sections of Walmart, London Drugs, Superstore or other drug stores. They are usually about half price by now which is a really inexpensive way to pick up two great Essie polishes at once! If you can't find it in a Christmas pack, I'm quite certain this polish is part of the regular permanent collection and should be available most anywhere.